A man has been arrested after police say he admitted to having more than 400 pounds of marijuana. A man was arrested after police confiscated more than 400 pounds of marijuana in Nashville. 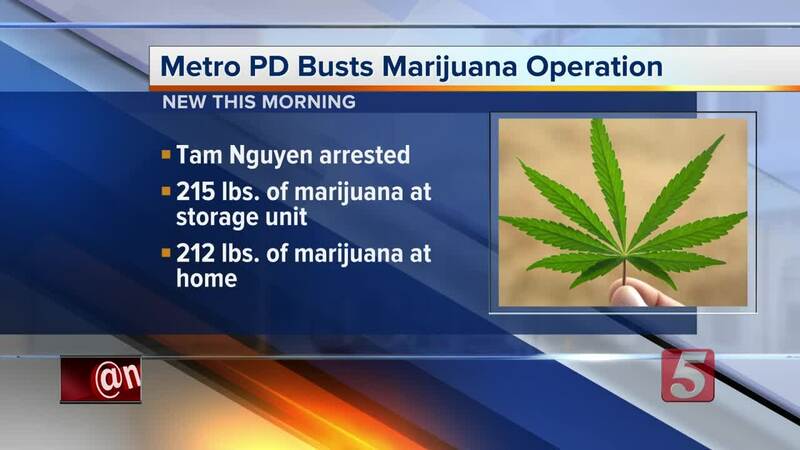 Metro Nashville police said 42-year-old Tam Nguyen was charged with having 445 pounds of marijuana that had been shipped here from California. It was to be sold in this area. Officers watched Thursday as he took possession of a storage pod that had been delivered to him at 6350 Nolensville Pike. He agreed to a search of the pod, which contained 215 pounds of marijuana in boxes, police said. Authorities also searched his Ashmore Drive home and found an additional 230 pounds of marijuana, $39,502 cash and $10,000 worth of money orders. Nguyen, who formerly lived in California, was jailed on two felony marijuana counts. His bond was set at $105,000.